Birthdate was 19 OCT 1735 o.s. Marriages for John Adams Jr.
Sources for John Adams Jr.
1 Braintree Massachusetts Vital Records, Births, Vol. 1, p. 202, Birth record for John Adams. 2 Find A Grave, (accessed 03/04/2014). 3 Massachusetts Vital Records to 1850 (Online Datebase), New England Historic Genealogical Society (2001-2008), Weymouth, Vol. 2, p. 11, Marriage record for John Adams and Abigail Smith. 5 Barthelmas, Della Gray, The Signers of the Declaration of Independence: A Biographical and Genealogical Reference, Jefferson, N.C. and London: McFarland and Company, Inc., Publishers (1997), 7-15. 6 Brogan, Hugh and Charles Mosley, American Presidential Families , New York: Macmillan Publishing Company (1993), 100-135. 7 Levin, Phyllis Lee, Abigail Adams: A Biography, New York: Thomas Dunne Books, An imprint of St. Martin's Press (2001), chart at front of book. 8 McCullough, David, John Adams, New York: Simon & Schuster (2001). 9 Roberts, Gary Boyd, Notable Kin, Volume 1 , Santa Clarita, California: Carl Boyer, 3rd (1998), 139. 12 Roberts, Gary Boyd, comp., Ancestors of American Presidents , Boston: New England Historic Genealogical Society (2009), 432, 465-466, 468-470. 13 The Massachusetts Historical Society, "Adams Time Line (1735-1889)", (accessed 08/02/2011). 14 Vinton, John Adams, The Vinton Memorial Comprising A Genealogy of the Descendants of John Vinton of Lynn, 1648, Boston: S.K. Whipple and Company (1858), 301, Google Books (Digital Library). 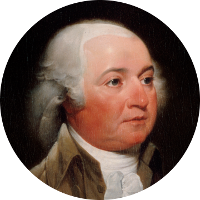 15 Wikipedia, "John Adams", (accessed 02/26/2010). 16 Williams, Alicia Crane, ed., Mayflower Families through Five Generations: Vol. 16, Part 1, Family of John Alden , Plymouth, Massachusetts: General Society of Mayflower Descendants (1999), 492.